In the grand racing tradition of Excitebike, get ready for a big-air experience like no other as players rocket their trucks across dynamically changing terrain. Remember tilting your arms while playing Excitebike to try to make your character land a huge jump? 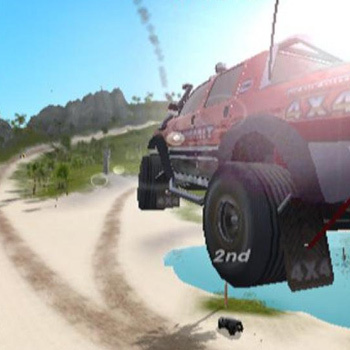 Well, that experience is finally a reality with Excite Truck, a wild, off-road race only possible on Nintendos Wii console. Players hold the Wii Remote like an NES controller to control the truck. The 2 button is the accelerator, the 1 button is the brake, the + Control Pad is the turbo … but that's just the beginning. Tilt the Wii Remote right and left like a steering wheel to steer. Once the truck goes airborne, tilt the Wii Remote every which way to line up perfect landings for turbo boosts. Pick up items on the courses to make the terrain deform in real time, turning innocent bumps into massive launch pads that affect not only the player's route, but that of his or her rivals. Players jump and bump their way to the highest score and highest finish.